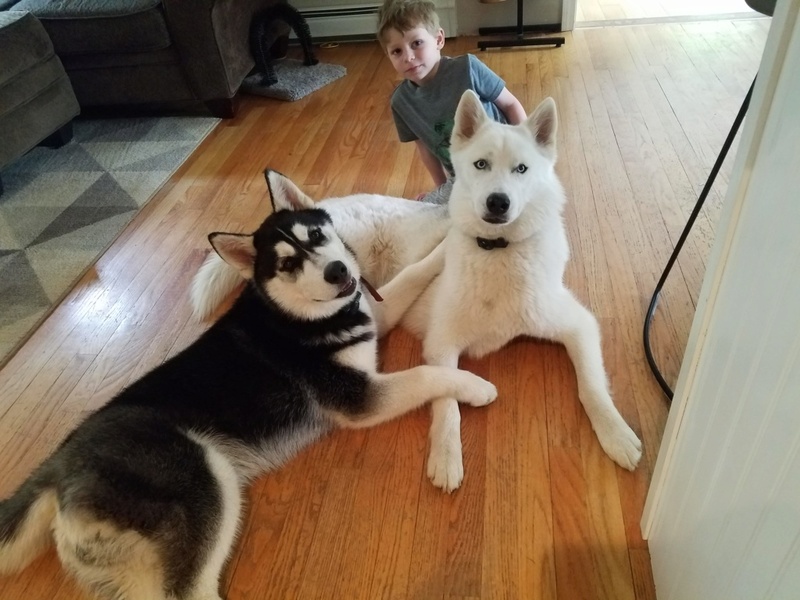 My husband and I are beginning to wonder if we have an Alusky rather than the Siberian we asked for. I only ask because this guy is 6 months old and weighed in at 51.8lbs the other day when he was going to get neutered. Seems like a lot for a young husky. Our two year old female weighs 65 in the winter and about 60 in the summer. Even I know she is not breed standard. But 52lbs at 6 months? And he is so stalky. Asking for opinions. I have akc paperwork but that isn't always worth anything. Curious if one of the ladies malamutes hopped the fence rather than the dog she thinks the female was studded with. Lol. There is nothing to me anyways that says anything but husky. Except the tail, is the pups tail really that short? 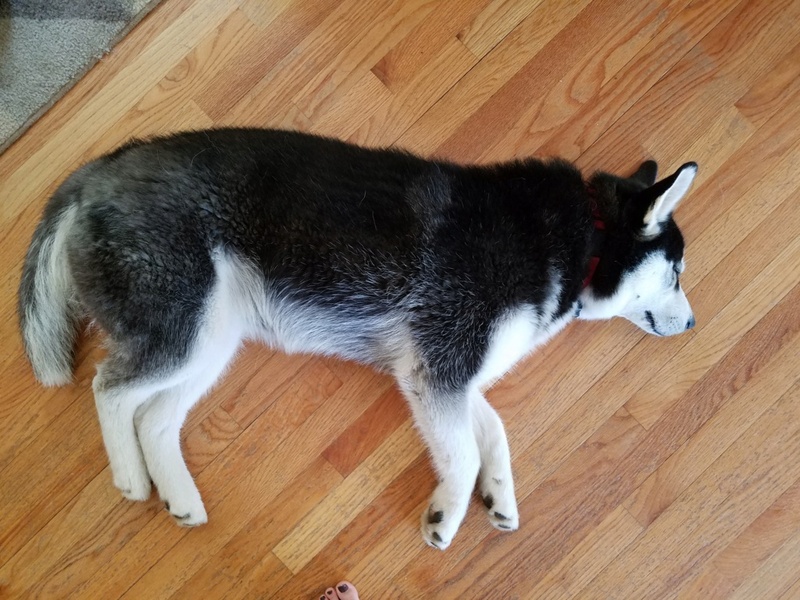 What about the pup besides weight that seems off for a husky? To be honest many breeders have AKC papers, doesn't mean they breed to standard. Your older husky is above female breed standard, should be no more than 45-50 pounds as is breed standard to AKC regs for show. Of course pet quality can weigh more or less. So I wouldn't be too concerned if your pup is 100% or not, you can do a dna test to answer your question, Embark and Wisdom Panel 4.0 is pretty accurate, Embark being a little more precise in % if indeed a mix. 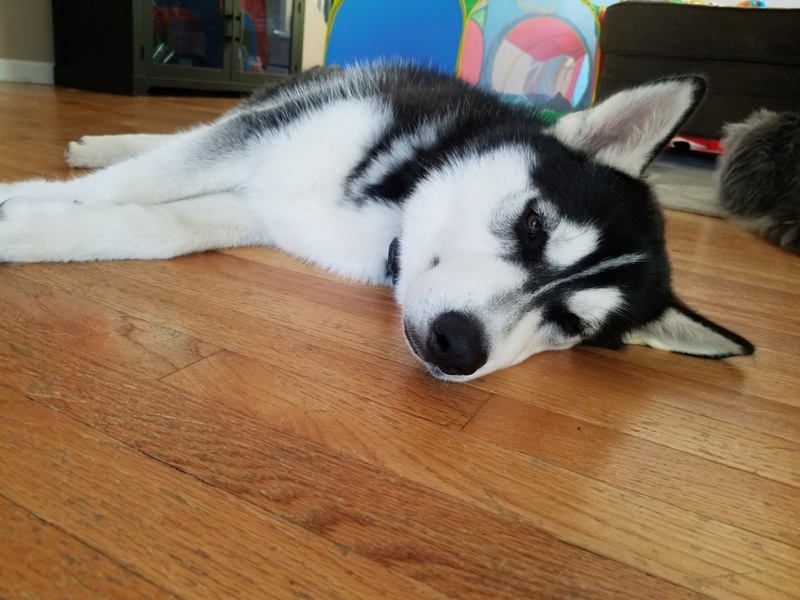 He looks Husky to me. How much are you feeding him and what food are you feeding him? The second picture, of him laying down, he looks pretty filled out for a puppy his age. Is it possible he's over eating? Looks husky to me, too. And, I'm gonna go with Jimmy - he looks awfully filled out for a 6 month old. Usually they're quite gangly at that age and people are asking "is he too skinny, do I need to feed him more?" And - Renee, the short tail? As best I can tell, it may be his tail his high set. Ami's tail seems short (I went through a period where I was certain he must have caught part of it in a door or something and the tip was cut off, silly mama that I am) but after reading a bunch of people and tail set, I realize Ami's tail is really high set, which is also probably why he has that snap tail. Really handsome dude you've got there, by the way! His tail is really that short. Looks a bit longer when he is standing. It is short and very thick. He is a very solid, muscular little guy. His thickness and weight is mostly why I am questioning him. 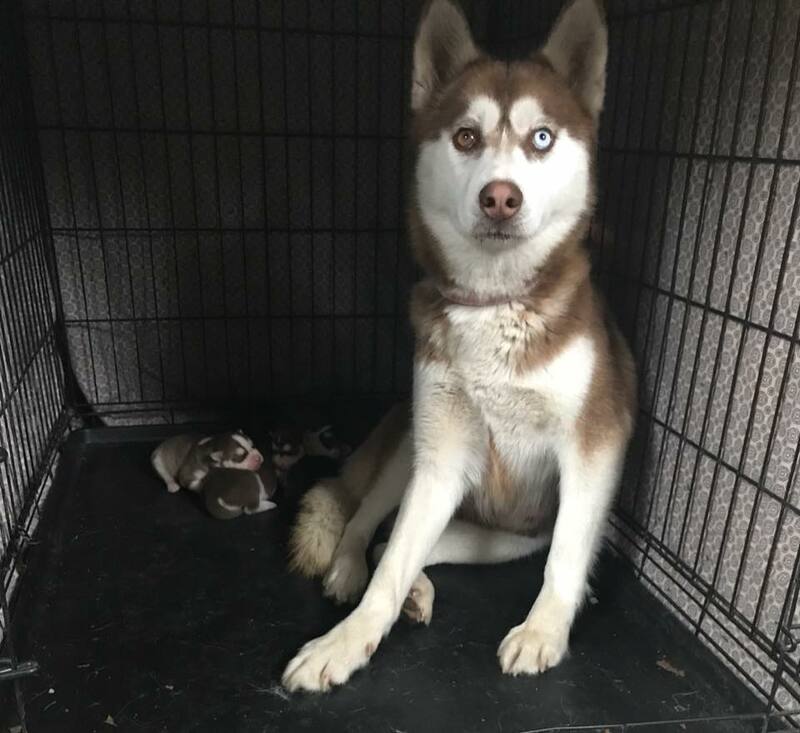 The breeder had Huskies and Malamutes. and does Siberian pups, malamutes and sometimes Aluskies so I know that the dogs do get to mingle. He does not have any extra skin to give other than around his collar. He is on Science Diet Puppy food and I have been following the feeding guidelines. He gets 3 3/4 cup of food per day broken into 3 meals. He was just neutered and the vet said that I am feeding him appropriately for his age and that he is just a solid guy. Why I am questioning his breed a little is: I feel like he is too thick in body mass, he has been like this since he was a pup but, we thought by now he may start to get more lean and show more definition with muscles and so forth. I can see them, just not defined like all my other huskies have been. We call him tootsie roll The tail is short and very thick. (not the hair, just thick in mass) Then the weight at this age. 52lbs seems heavy for a 6month old Siberian Husky pup. Lastly,his coat is very dense. Maybe he is just going to be my oddball. He is a very timid, reserved with people for the first bit and a lazy pup. That's Science Diet Puppy. A lot of whole grain, meaning a lot of fiber that is useless to the dog. Corn gluten meal is part of the protein but, a dog doesn't digest corn well at all, it's useless to them, Sorgum is gain too, high calorie but, that's all it offers is calories. Liver FLAVOR, not liver. There are better foods out there for the same or even a lower price. You might want to consider a diet change to one with meat or meat meal for the first three and, no gluten, no corn anything. I had a Malamute for 16 years, from the time he was 8 weeks old. Later I'll take a pic of a picture I have of him (that long ago we didn't have digital cameras, haha) and you'll see he looked much like a husky at that same age, only slightly taller, but looked quite lanky. He didn't start filling out til I'd say about 2 years old or so. Your guy just has a very solid look that for his age, doesn't seem right and why I asked if he's possibly over eating. He isn't getting into your other pups food is he? 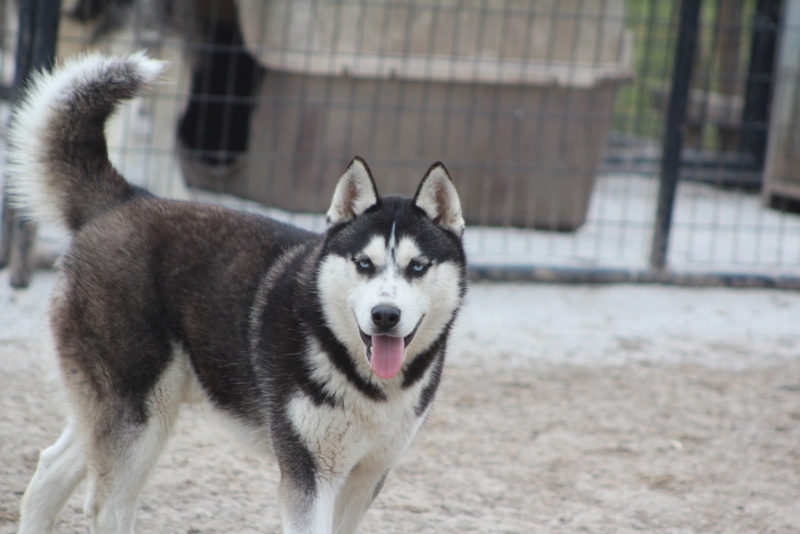 He looks very much like a pure Siberian Husky to me, did you get to see his parents? If so, what were they like? I agree, looks like a rolly polly husky and, that isn't what you want at that age. They should be lanky looking as pups and until about 1.5 to two years old. We all like to treat and spoil our dogs but, that isn't the best way to spoil them - do it with play and affection, going places the dog enjoys and such, not food. @bluemoods He only gets fed his food, from his bowl. He does not receive people food. 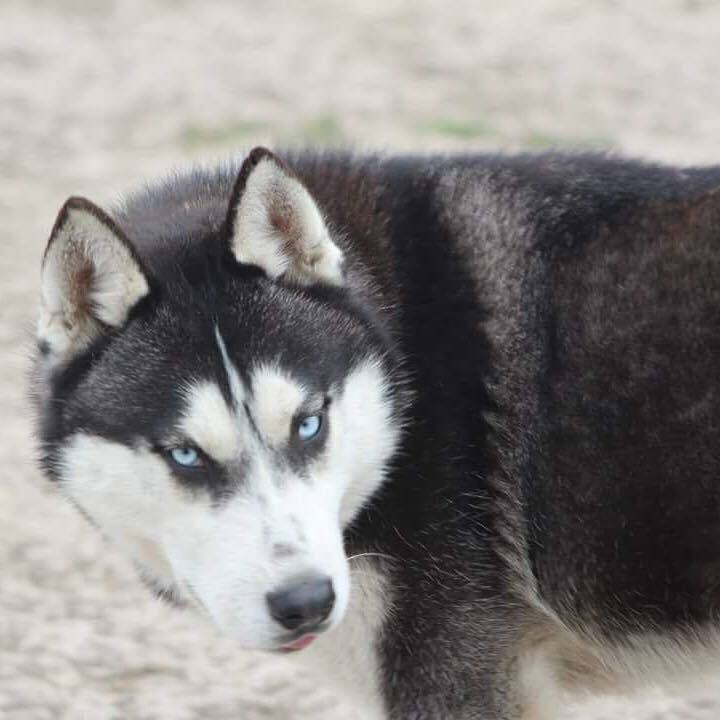 I have had great experience with knowing that my huskies have had sensitive stomachs and should stick to their diets strictly unless, they are ill and need a bland diet. I wasn't aware Science Diet was on the crap food list... He has 3 acres to roam and gets to go on walks with his sister as well. He is well exercised I'd say. Sophie due this coming July 4th. His parents are absolutely beautiful, I love Roman. 'K, I mean no disrespect by what I'm about to say but as I looked at the pics, his body shape looks like pregnant Sophie. At first, I misread the captions and thought, "oh, he looks like Roman, his dad" but then I saw the last two pics were Roman. Im thinking his food is making him bulk up like that, because really, I see absolutely no Malamute in him. It's still possible it's there, and a DNA test would tell you that, but my Malamute at his heaviest was 67 lbs. 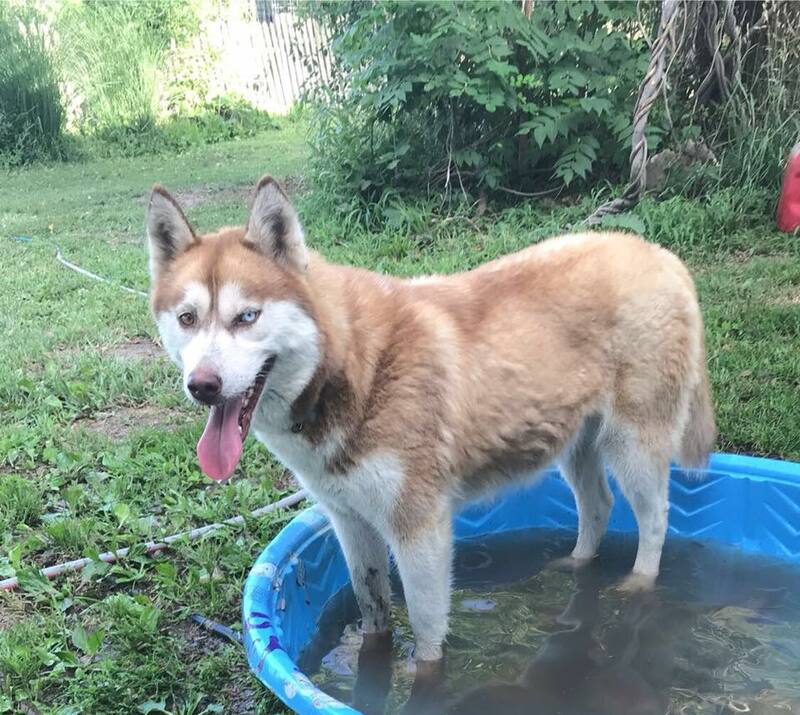 there are larger Malamutes of course, but like I mentioned earlier, they're pretty scrawny for the first 2 years or so. You mentioned your girl is even a bit heavier than what is considered standard so it is, in my mind, quite possible their food is making them bulk up. Many pups are tootsie rolls when they're little, but at 6 months they're into that "some things are growing, some things aren't" stage. I'll look into the food again. When he had surgery last week I had them run a full blood panel and urine test and I had discussed his weight and such with the vet. The vet said his bloodwork was flawless and that he was happy with his diet. Doesn't not mean there are not better options. I have been watching him and talking to the vet whenever we see him and he ensures us Atka is just a big guy. I agree though, at this age he should be lanky. Shila was like that for the longest. Even now she is not a big dog, just a bit taller than most Huskies but not fat at all. I just want to do right by him and maybe it's his genetics. His dad as you can see has the longer and more round ribcage too. I just want him to be healthy. Here are some pics of Shila I recently took in sport mode while we were put walking, and then the two of laying together. Shila and Atka side by side. 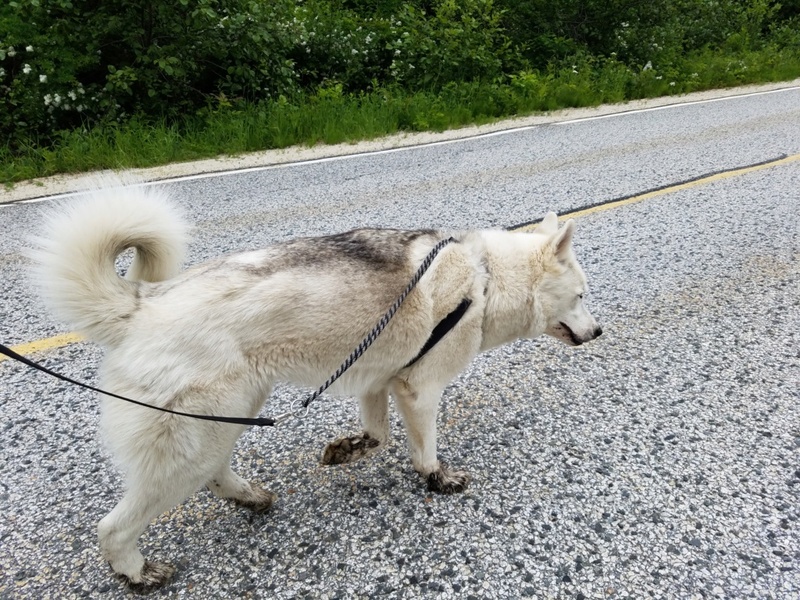 Here is Atka standing with his side profile showing. Atka looks much smaller, very much a puppy look still. Very solid too but not necessarily in a bad way (these are current pictures?) he doesn't look quite as solid as the laying down pic up above, and seeing how "puppyish" he still looks, can't decide if he is still to heavy or if he's just slower on the growth spurts kinda thing, ugh, but his actual weight is heavy. 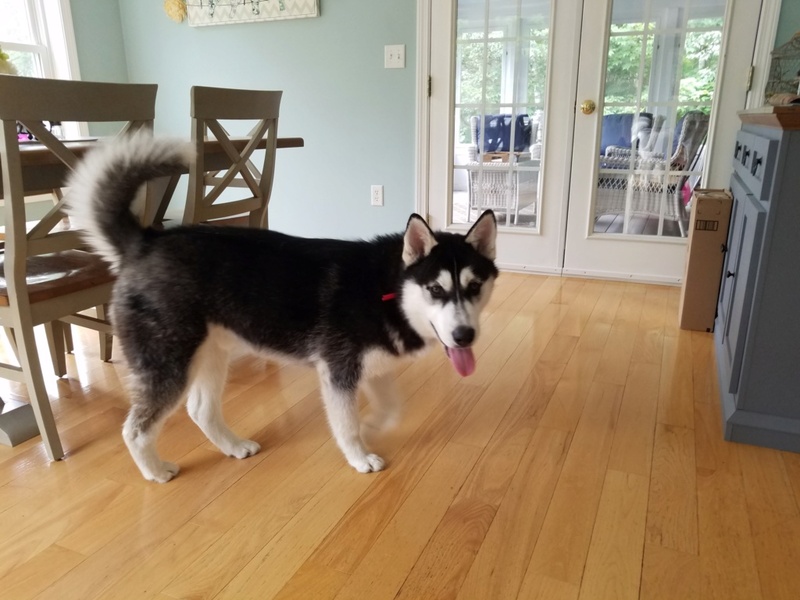 I really don't know, I don't see Malamute, his parents (that we know of) seem to be in standard as far as size and stuff (from what i can tell, it's super hard sometimes to judge size going by pics) I really don't know what to tell you. A DNA test may be the only way to find out if there is another breed in him causing his weight. The scale was correct, right? Have you weighed him after that? These pictures are current. I was snapping them and then uploading to try to show his different angles. 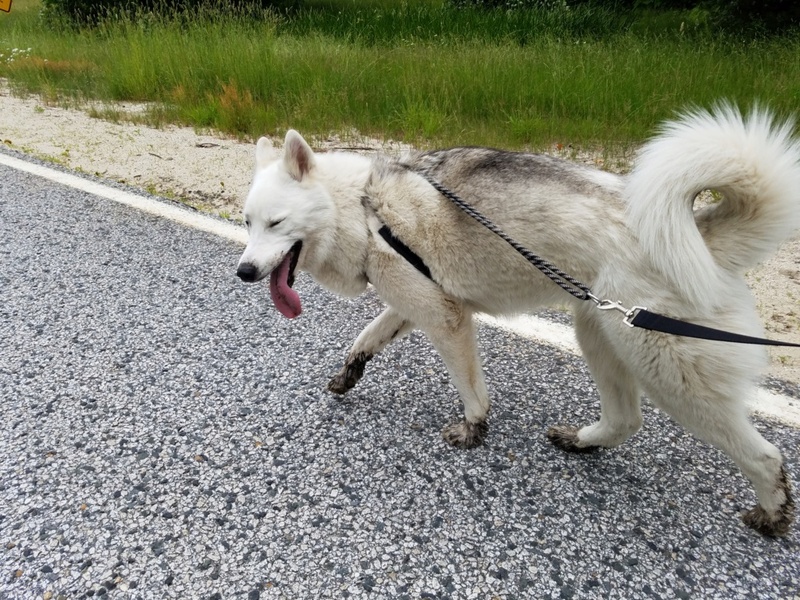 Shila's walk photos were a week old. As always, I appreciate the replies and opinions. Like I stated in my original post it has just been a curiosity of ours because of his weight and thick ribcage. I have not weighed him myself, and I wish I did have them weigh him twice just to verify that was correct. I'll have to have my husband pick him up. Me holding him is a little awkward since I'm so little and he doesn't feel comfortable in my arms lol!!! He is a strong and thick little guy and I know he has a lot of growing to do. Shila just hit two in April and she has just now finally finished filling out I think. Maybe he is just going to have a different body type than what I've had. I did notice your pups look to have a more stocky appearance too, unless that is all fur. The seem to be extra fluffy lol. They are super cute. And it looks like your Male has a party eye? I'd try and get him on the scale again, I know with my two, Kohdi doesn't like to stand still so I always have to put him back on. Last time we were there, he weighed 62lbs so he can probably lose a few pounds. I can't blame it all on his fluff, LOL. But yeah, their fluff adds to their stocky appearance, I have pics where the sun is hitting them just right and I can see their actual outline underneath all that fluff, hahaha. Yes, Kohdi has a parti eye, and thank you! On Instagram I follow a Malamute, she has eyes almost exactly like Atka's mother in her first pic, above. So POSSIBLY there is Malamute somewhere in him somewhere down the line. I didn't notice it til last night when I saw a pic she posted. 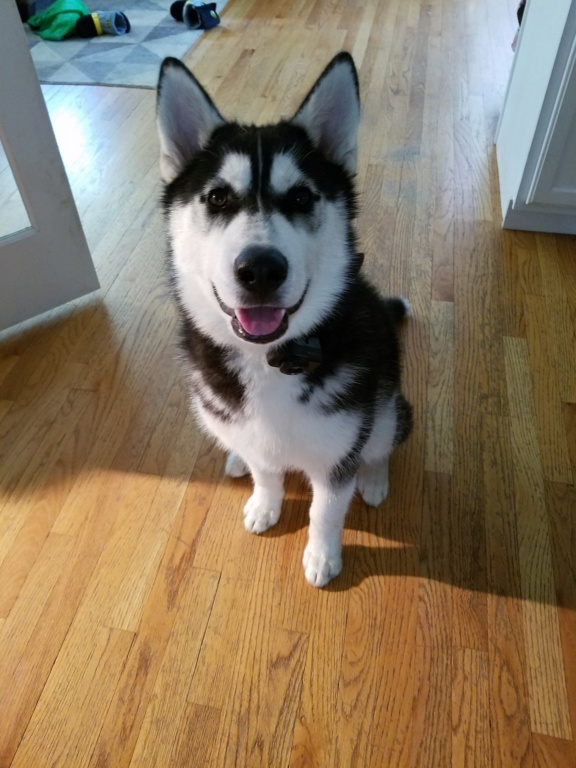 As far as his head/face, you wouldn't know it though, he looks pure Husky to me. If you really want to know I would just opt for a DNA test. Wisdom panel and Embark are your top two. Embark is pricey but you get a lot of medical information with it that can be valuable to some. Wisdom is cheaper and you will still get a couple of the top medical inquiries with it. Both are pretty accurate, especially with common breeds and breed mixes. Subject: Re: Questioning if I have an Alusky.